Now you have a lovely looking page it is time to start looking into your content to create an exciting, high quality content on your website. What are you going to post? What do you want to post? At the heart of social media is communication, and us humans like to communicate in many different ways. Although when spending time on screens it is fair to say we like our visuals. Specifically talking about Facebook, if you remember the olden days of status updates you will notice the transition from an early 2000’s wordy looking newsfeed into today’s viral videos and topical articles. Indeed even the visual header for most articles now include GIFS and small snippets of videos. 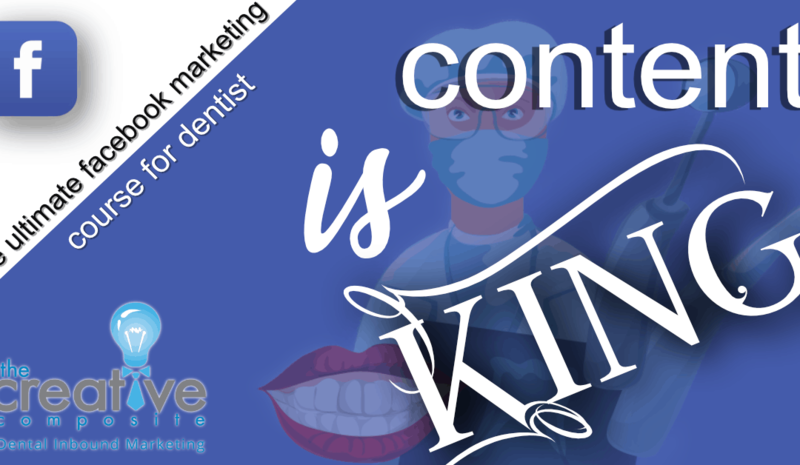 So keep reading to find out what content you need to make your practice great on Facebook. So now that we have established visual content is where you should start, what sort of visual content would be good for you? The idea of doing videos on any platforms can feel like a daunting task, after all, you did choose dentistry over Hollywood. But that’s not to say you are not a star. You and your team, even your patients all love the limelight even if they don’t want to admit it. Start with a simple introduction to yourself, to your team. Make sure to include your practice’s personality. People will gravitate to others they can relate to, new potential clients may and will choose you because they like you. This does not mean you need to turn into a blockbuster producer or a stand-up comedian. Simply stay true to yourself, and don’t be afraid to have little f un. It is important to note that these introductory videos and any other videos you make do not need a team of professional filmmakers behind them. Any smartphone nowadays will have a camera good enough for social media videos. Or if you would like to use a digital camera, then go for it. The one we would recommend is an easy to use Canon DSLR. When it comes to editing, again you don’t need to go and spend a fortune on the software they used for Avatar. Most computers come with basic and simple editing software which is easy to navigate for novices as well as experts. With Apple products look for iMovie, and for Windows search programmes for Windows Movie Maker. Of course with your intro videos, you can always cover everything you need in one take. This is something important to note while people enjoy Facebook for its visual content. they are not there to watch feature-length films. So make sure to keep your videos short and snappy in order to retain viewers and excite and engage new and existing customers. When it comes to other kinds of videos, note that you do not just have to stick to dentistry. Indeed, while this may at first feel like a strange move, note that your audience will grow because they enjoy what post. This means posting and sharing content that your audience will enjoy. What is going on in your local area? Are you involved? Is your family going? Naturally, you do not need to become a dental practice and also the latest news outlet. There is no harm in sharing and voicing your opinion on local events and news. Other kinds of video that you want to have posted on your Facebook, are testimonials. You have happy customers, there is nothing wrong with showing them off. If we look at Oakley Dental as an example, they often have customers involved in their videos to show how they make customers smile in more ways than one. Whilst business facebook page allows for customers to leave reviews and of course they can give you a star rating, it will help build trust with your audience if all your clients including potential ones can see real life showcases. Before and afters of various treatments and services- this is especially true if you provide cosmetic enhancements or fulfil a dentistry niche. Furthermore, just like you, your patients have a personality. Let them voice their satisfaction, and let them do it on camera. A happy customer will more than likely be happy to help you out as they will want to reciprocate after your excellent service. Another form of video content is live video. Facebook live is a great way to actively engage your audience. Everyone who is following your page will automatically receive a notification whenever you go live, and people are more likely to engage when a video is live more than when it is no longer live. Furthermore, can share your live video while it is happening which will, in turn, help build your audience, as well as increase your client base. When it comes to live video you could film treatments as they happen, capture instant reviews from customers just after they have revived their treatment. As well as sharing any interesting or funny moments that happen throughout your day. After all, everything you post on social media is about building a personal trust and bond with your audience in order to grow and increase your conversion. Remember it is always important to experiment and adjust. While a certain video may work one week it may not the next. Don’t forget to take advantage of Facebook analytics and never be afraid to try out new things. WANT TO LEARN MORE? BOOK A CONSULTATION NOW! Moving away from video, of course as you know there are also other things you can post and use to engage your audience. It is understandable that you are busy running a practice and will not always have time to make a video. So never be afraid to post photos. Whilst visual content is the most popular, it is also important to provide variety. Facebook and all social media make it easy to post as much and as often as you want. Variety allows you to show that you are more than just a one trick pony. It also helps you to look and feel less like a hard lines business page but instead another Facebook friends interacting naturally on a social media platform. So what kind of photos should you post? Well keeping it personal never be afraid to show off your good side with a selfie. This could be just you, your team and even you with your patients. You can always caption your post with a question. For example something like “Is everyone enjoying that Friday feeling?” , this accompanied with a selfie, will help encourage engagement. Note that these questions do not always have to be along the lines of friendly small talk. You can engage your fans with questions about your practice. An example of this would be something like “Would you want a text reminder about your appointment?” People will naturally want their voice to be heard especially on a matter that is going to personally affect them. So what else can you post? Other things you can post include inspirational quotes. Now I know you might be thinking, surely some inspirational quote will come across as cheesy but quotes are one of the most engaged forms of content across social media including Facebook. Of course, not all the content you create is going to be made for Facebook. You also have a website, blog posts and naturally other forms of social media. I know I have probably talked your ear off about visual content however, it is also important to link to blog posts and take clients out of the Facebook and to your website. After all, that is where you want them to be, not only will it increase your SEO (search engine optimisation) but it will also help convert customers as they explore and learn more about you. We would recommend using a header photo in order to capture the interest of your audience. For example, if your blog post is about the benefits of Invisalign then your header photo could be a before and after shot of one of your patients. This image will also be used in your blog, do not worry you do not need different photos for Facebook and your original blog post. In fact, the more uniform the better as your audience will easily be able to recognise read through and keep note of your post. With your blogs, it is important to note that if you provide your readers with valuable information they are more likely to reciprocate that value by sharing, liking and even going ahead and using your services. Note that nearly everyone likes learning something new. There is a certain sense of satisfaction that comes from understanding and finding out something that you didn’t before. Whatever, you are posting don’t be afraid to link your content or create content to post relating to trending topics. Moreover as well as looking into what is currently trending, you can also celebrate holidays whatever they may be. Whether it is the big guys such as Christmas or Easter but also all to those hallmark holidays like national snake day, or national girlfriend day. Whilst you don’t have to do all of them, this is where knowing your audience comes in useful. See what holidays they are interested in and which one they celebrate and adjust your posts accordingly. This does not mean that you need to be down with the kids as it were, there is no harm in keeping it simple. As a local business maybe you can start with what is trending in your local area, and local news instead of tackling the global trends. But of course never be afraid to experiment and try something new whenever you can. As I have mentioned multiple times throughout this post, I am aware that you are busy running a practice and do not necessarily have the time to constantly create new content. This is where recycling past content that created revenue can come in helpful. Facebook even allows you to see memories, allowing you to see what you posted on specific days however many years ago. This means that you can share older posts and take yourself and your audience on a trip down memory lane. Of course, as you might have already guessed this is not something I would recommend doing every day as people will quickly tire of seeing the same content fill up their feed. But every now and again your audience can look back at some of your great or even your embarrassing posts. This will help you build a personal relationship with them as well as a relationship that has a history. Finally, the main points to remember from this piece is that first and foremost you want to build a relationship with your audience. Whoever they may be. Do not be afraid to let the personality of your practice, team and patients shine through. People love people not well-oiled machines. Post content that is enjoyable, provides value and takes advantage of a highly visual platform. Engage with your followers as often as you can and encourage open and honest feedback to not only help improve your practice but also let your clients feel appreciated.